I found this project on a new site called Bloom. (Which I happen to love by the way.) It was so easy and so fun that I'm thinking of making some Thanksgiving ones as well. The directions are all right here. *Here is where I got my witch. *And my Thanksgiving silhouettes? Here. SO cute! 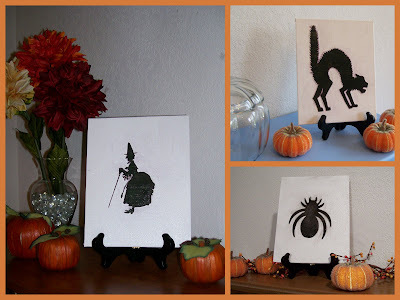 Martha Stewart has glittered silhouettes too! So much fun! I love how those turned out. Darling. I'll have to try some. Cute! My 3-year-old son has been begging me to decorate for Halloween and I'm going to use this idea!